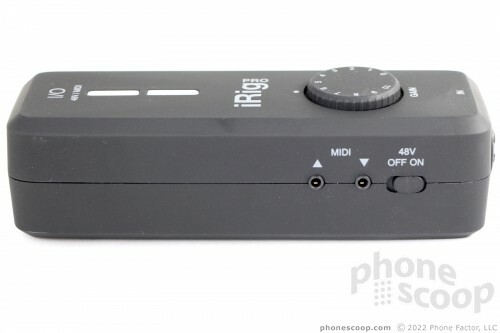 The iRig Pro I/O is a compact audio interface that lets musicians, singers, and podcasters connect their instruments or microphones to Apple iPhones, iPads, and Macs. It takes all the best features of the larger iRig Pro Duo and boils them down to the most essential tools in a highly portable package. As good as Apple's devices are at recording audio on their own, the internal mics can only do so much. You're better off connecting your guitar or microphone to the iPhone. In order to do that with quality, you need an in-between device that converts the analog signals from your instrument to the digital signals needed by your iPhone. 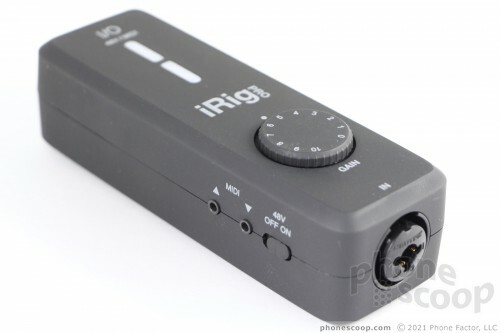 The iRig Pro I/O from IK Multimedia is a portable adapter that accommodates guitars, basses, keyboards, microphones, and even MIDI gear. Paired with IK Multimedia's various apps, the Pro I/O lets you turn any space into a recording studio on the go. The iRig Pro I/O looks as though IK Multimedia took its larger Pro Duo, which we reviewed last year, and chopped it in half. The I/O may be smaller than the Duo, but it actually has more features. The Pro I/O is really compact, measuring about 5 by 1.73 by 1.37 inches. You can't quite tote it around in your pocket, but it's small and light enough to stick in a gig bag, backpack, or briefcase. It's really easy to hold and use one-handed. I like the matte black finish. All six surfaces of the elongated rectangular box have something going on. The main controls — a rotating gain (volume) knob and multi-colored LEDs — are on the front surface. The knob spins nicely and has well-marked numbers. The two LEDs change from red to green to blue to orange depending on the input levels. The main input is on the bottom edge. 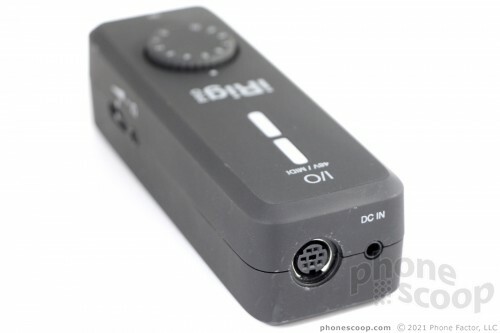 The Pro I/O can handle a standard Â¼-inch instrument cable or XLR mic cable in the combo port. You can only plug one instrument/mic into the Pro I/O at a time. The left side houses a brand new feature: 1/8-inch MIDI ports. These let you connect the Pro I/O to any piece of MIDI equipment. You'll also find an on/off switch for the 48v phantom power control on the left edge. 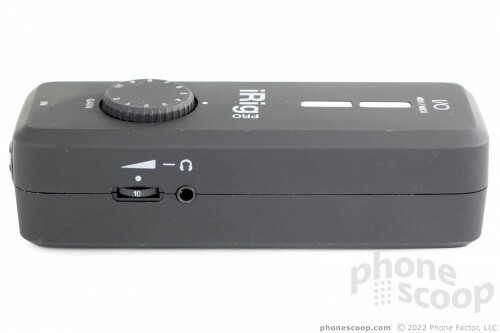 The right edge holds a â…›-inch (3.5mm) output jack for headphones for live listening. A dial below the jack lets you fine-tune the headphone volume. It works well. The top edge holds the main port for connecting the Pro I/O to your iPhone, iPad, or Mac. The device is MFI (Made for iPhone) compliant. IK Multimedia supplied all the necessary cables (serial-to-USB, serial-to-Lightning) so you won't have to make a run to your local music store to get connected to your iPhone or Mac. The device doesn't come with a cable for Android devices and it's pretty clear to me IK Multimedia has abandoned Android. IK Multimedia does sell a $29 cable for older Android phones with microUSB ports. The Pro I/O does not support newer Android devices with USB-C ports, and IK Multimedia hasn't updated the majority of its Android apps in years. Two broad rubber feet on the rear will help keep the Pro I/O in place when it's sitting. A loop on the rear lets you snake a velcro strap through so you can attach the iRig to a mic stand if you want. The Pro I/O runs on two AA batteries, which IK Multimedia kindly supplies in the box. The battery cover is easy to remove and replace. 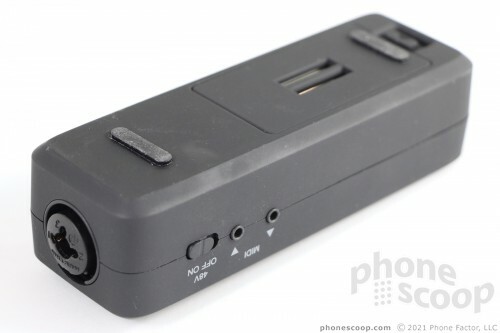 Or, a small port on top accepts most any 9V power supply, though IK Multimedia suggests you use its adapter ($39). Another new feature: when connected to power, the Pro I/O will charge your iPhone or iPad. That means you can record for as long as necessary to get that perfect take. It's hard to believe IK Multimedia crammed so much functionality into such a small box. Android users should forget about the Pro I/O. Technically speaking, you can download the AmpliTube app to your Android device and connect to the Pro I/O if you spend $30 extra to get the necessary microUSB cable. However, it seems clear that IK has abandoned Android support. We can't recommend something that may not be supported, or may stop working the next time you update your phone's OS. It's a shame, considering Android accounts for about 50% of the U.S. market and about 85% of the global market. The iRig Pro I/O works natively with IK Multimedia's AmpliTube application on iPhones, iPads, and the Mac. You can download the mobile app easily from the iTunes App Store, but you'll need to register the Pro I/O with IK Multimedia to gain access to the desktop version of AmpliTube for Mac. You also get free versions of SampleTank 3, TrackS Deluxe, and MicRoom. Each app is rich with features that are available in the free version, but the best stuff (different amp voicings, etc.) requires in-app purchases. Guitar, bass, and keyboard players will focus on AmpliTube, while podcasters will mainly take advantage of TrackS and MicRoom. Podcasters can alternately choose to download IK Multimedia's iRig Recorder, also free. AmpliTube hasn't changed much since I last reviewed it. The app provides access to four basic guitar voicings (clean, crunch, lead, and metal) as well as several for bass. You can tweak gain, treble, mid, bass, presence, reverb, and volume controls for each amp style. Each of these amp styles can be paired with several different cabinet styles, two different virtual mics, and about a dozen free effects pedals. AmpliTube also includes a tuner, metronome, and drum loops. The free version of AmpliTube offers plenty of ways to tweak your sound without ponying up for the brand-name (Fender, Vox, Orange) amp effects. Multitrack recording is available as an in-app purchase, as are more advanced editing tools. AmpliTube becomes more user-friendly when it can take advantage of the larger screen of the iPad. Unfortunately, IK Multimedia hasn't yet updated *any* of its apps for the iPhone X. I found that frustrating, given the lost screen real estate. 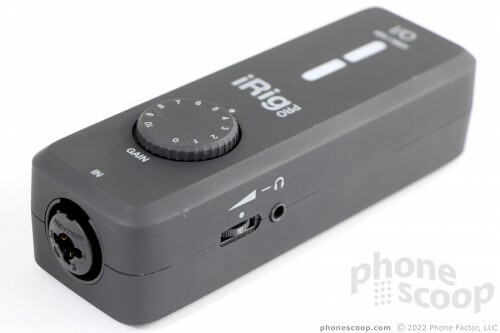 IK Multimedia's iRig Recorder is your best bet for recording vocals and/or voices via the Pro I/O. 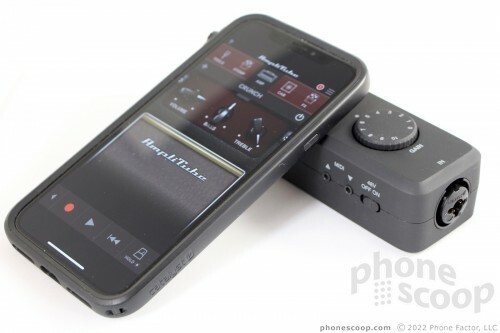 It works together with the Mic Room companion app for recording rich, warm voice recordings. This is what you'd use for capturing podcasts, if you were so inclined. It lets you capture mono or stereo recordings (with the right mics), includes wave forms, and even lets you capture video if you want. This would be ideal for, say, journalists who wanted to use an external mix when interviewing a subject on video. The Mic Room app works in coordination with iRig Recorder for advanced functions, such as adding effects and adjusting tone. 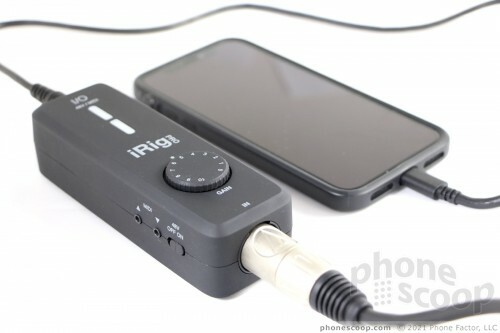 The iRig Pro I/O also works perfectly with Apple's GarageBand app, as well as many other third-party apps that accept Lightning-based mic input. Thanks to the myriad input options, the iRig Pro I/O lets you explore lots of ways to create digital music. I tested the Pro I/O with regular microphones, guitars, and keyboards. It accepts all these thanks to the universal jack. The gain control helps you manage input levels perfectly, and having the option to power your iOS device while fiddling around is a welcome bonus. I got the best-sounding guitar audio by using a real microphone, rather than patching my guitar into AmpliTube's virtual amps. That said, you can record and produce fine tones by skipping your amp and using IK Multimedia's software. I do appreciate the flexibility offered by AmpliTube's swappable amps, cabinets, and mics. You will need to spend time tweaking the software, but most musicians relish time spent with their gear making such adjustments to find the tone they want. The iRig Pro I/O faithfully worked with my iPhone, iPad, and Mac, allowing me to dial in a range of sounds and record them on a whim. Musicians and singers looking to add to their arsenal of tools should strongly consider the iRig Pro I/O from IK Multimedia. 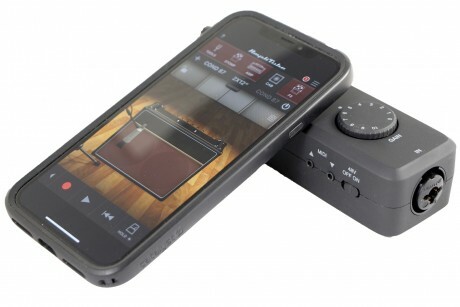 It easily lets you connect your guitar, bass, keyboard, or microphone to your iPhone, iPad, or Mac, and includes all the software you need to create rich-sounding recordings. 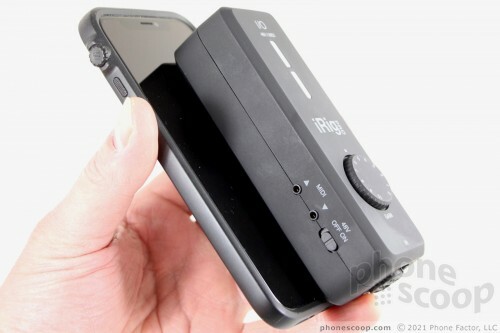 If you're a podcaster, the Pro I/O does cover the basics of attaching a mic to your iPhone so you can record. But there are good, dedicated mobile mics that connect directly to your iPhone. 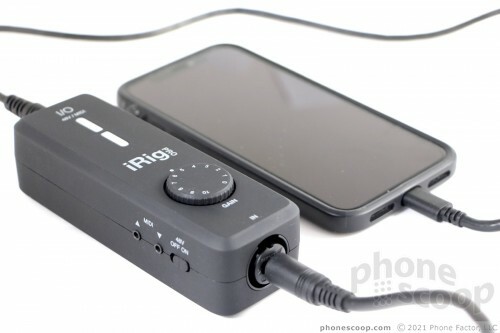 There's no need to put the iRig Pro I/O in between the mic and your phone. 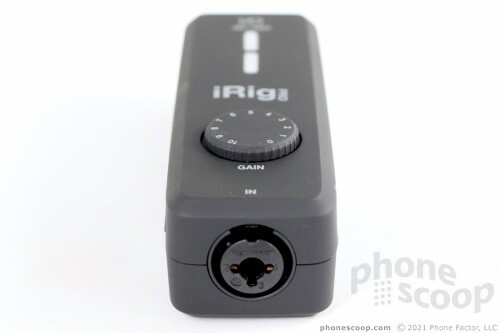 IK Multimedia sells the iRig Pro I/O for $150, or about $50 less than the two-channel Duo Pro. I like the compact size, that it offers AC power to your mobile device, and provides control over the input signal. I was able to record various instruments in all manner of voicings and found the overall results to be very good. I do have to ding IK Multimedia for its disappointing lack of support for Android, however. Since you can't lug your amplifiers or recording studio everywhere you go, the iRig Pro I/O, together with AmpliTube and iRig Recorder, is a fine stand-in for when those creative or inspired moments strike you.